The saree fall is a constant, vital companion of saree. Just as you can’t do without a form-flattering, well-fitting blouse, you have to have a saree fall attached well, in order to get a good drape. Many new saree wearers, though, don’t understand this compulsion. Plus, many of you may not even know what a saree fall is, or why is it important. So, we bring you all the FAQs you may have in your mind, with regard to the saree fall. Q1. What is a Saree Fall? As the name suggests, the sari fall ensures that your sari pleats fall nicely. Saree fall refers to a sturdy cotton or terry-cotton 5 inches broad and 3 metres long strip of fabric - that is sewed and attached to the hem of a saree, such that it covers the initial drape and pleats area only. Fall is attached from the wrong side of the sari, and must not be visible from the outside. The Sari Pallu and the final drape leading to Pallu don’t have the fall. Q2. Why is a Saree Fall attached? Sarees are unstitched reams of fabrics. On their own, many of them lack tensile strength and are, thus, prone to stretching and tearing. The saree hem that falls near feet is liable to entangle with foot-wear or come under feet, and may keep scraping the ground and hard surfaces, when the wearer walks. This further subjects the saree hem to tearing and damage. Also, many sarees are made in flowy, fluid, light-weight fabrics, which keep flying off, when tied. Pleating such sarees and keeping their pleats in place is quite difficult. Saree Fall is used to take care of all these issues. The extra fabric sewed to the saree lends weight and strength, thus making a saree stiffer. This ensures easier and defter pleating, leading to a graceful fall of the saree fabric. Pleats stay in place, thanks to saree fall as it adds weight. Saree fall supports the hemline as well as the whole fabric, by fighting gravity and scratches (from foot-wear and ground). Q3. Who attaches the Saree Fall? These days, most stores offer to attach the saree fall and finish a saree, before delivering it to the customer. In India, traditionally, friendly neighborhood tailors oblidge and agree to attach saree falls, and thus, rarely anyone gives proper thought to saree’s humble companion. Q4. Does a saree fall need to be attached by hand only? If you do not have an access to tailors or home-sewers to get saree fall attached by hand, look around, as these days saree falls are attached by sewing machines too. Many believe that this is not a good method, as the look achieved is not flawless or absolutely clean. However, if you don’t have a choice, this is better than not having any saree fall at all. This method is also quicker than the traditional hand sewing. Q5. Why would someone need to attach a saree fall herself? Asking for Saree fall attachment from a retail store leads to delay of a day or two in delivery. Now, will this work if you wish to wear a just-bought saree for a function? Same applies, if you plan to give out the saree to a tailor for fall attachments, as any tailor will typically ask for a few days, before he/ she returns your ‘finished’ saree. In such a case, your plans of wearing a fresh-from-store saree won’t work (even if you already have a matching blouse in your closet). These days, many online and retail merchants do not offer fall-sewing facility, as fall-attachment restricts the ‘exchange’ of a sold product. This further becomes a glaring issue, especially when women move outside India, and need to do this seemingly-simple tedious task on their own, or rely on an elderly relative. Once the luxury of down-the-street fall and peeco (beading) tailors fades, many sari loving women realize its importance. Q6. Why should I learn to attach a Saree Fall myself? Keeping aforementioned issues, there would be times, when you will need to attach the saree fall on your beloved saree - on your own. Thus, it makes sense to learn to do this simple attachment. Q7. How to choose a Saree Fall? The first step, many don’t realize, here would be to choose and buy a proper saree fall. COLOUR - Fall must perfectly match the saree’s colour. The fall should not show from under the (transparent) saree, unless intended otherwise. Thus, don’t just go by the saree’s base colour. Take into account the hem and border colour. For example, let’s say your saree is pale yellow, and has a dark brown border. Note the width of the border. If your saree border is same width or more than the usual fall (4-5 inches), pick one that is in same colour as the border. This will ensure the colour doesn’t visibly peep out of the saree hem, even if a pleat folds, at times. However, if the border width is lesser than the fall width, select the fall colour as per the saree’s base hue. FABRIC - Pick cotton or terry-cot falls, which are sturdy and stiff. Polyester falls tend to be slippery, and attaching them can be quite a task. Thick falls do not automatically translate to better falls, so choose wisely. Rubia cotton is a popular and suitable fall fabric, available at most fall sellers. 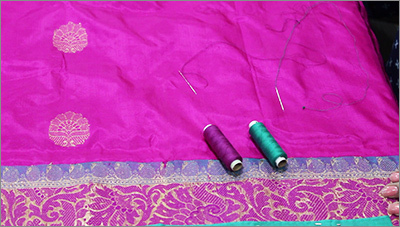 Colour Fastness – Check a fall for colour bleeding, before attaching it to your saree. Do not attach a fall, if its colour is not fast and bleeds, as it will destroy your saree later on. Preferably, was the sari fall, dry and iron it before sewing it on. This also ensures that the starch from cotton falls is removed effectively. Q8. How to attach a Saree Fall myself? Buy a suitable saree fall. Wash and prepare the fall for attachment. Turn in its edges from breadth with gentle stitches (length is generally secured already). You will need a few all-purpose pins, matching thread and thin sewing needle for fall attaching. You should know how do basic running stitch (and preferably back stitch) to do this by hand..
Do not attempt attaching a fall by machine, unless you are adept at it, and your machine has appropriate settings and needle for this purpose. Spread and lay your saree flat on a surface, and attach the saree fall on the wrong side - with all-pins to the area that requires the fall (the fall must end before the drape that lead to the pallu). Now, use running stitch to secure the lower end of the fall first, as it is less tricky. Keep using back stitches intermittently, to ensure a stronger attachment. 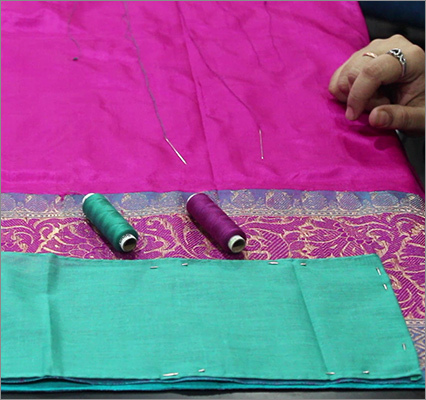 Ensure the stitches are not big, when passing thread on the right side of the saree. Repeat the same process on the upper end of the fall, but be extremely careful, while doing this. Here, the thread should be not visible on the right side at all, so keep your stitches tiny. Also, there should not be any fabric folds (even minor ones), to ensure the fall looks good. If the fall is not attached properly from the upper end, it can destroy the whole look and fall of the saree. Q.9 Can I wear a saree without a saree fall? Well, ideally, a saree should not be worn without attaching a fall to it first. However, if you really are in a hurry, you may wear sarees in thick, sturdy fabrics, once or twice, without a saree fall. Ensure that you walk carefully, and the saree edge/ hem doesn’t come under your feet. Thin and light-weight fabrics definitely need a saree fall, or they will not drape, pleat and fall well. 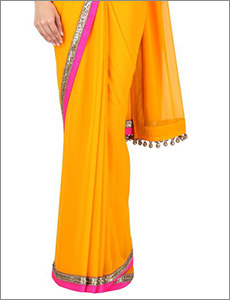 Net sarees, chiffons and georgettes should be reinforced with good saree falls. Delicate sarees like silks, ones with fragile resham edges like Banarasis and pure handloom ones must be worn, only after they have been sewed with a fall, unless you want to risk tearing the edges of your expensive sarees.